Antarctic Pavilion, Fondamenta Zattere Al Ponte Lungo, 1412, 30123 Venezia, Italia. May 12th – July 31st, 2017. 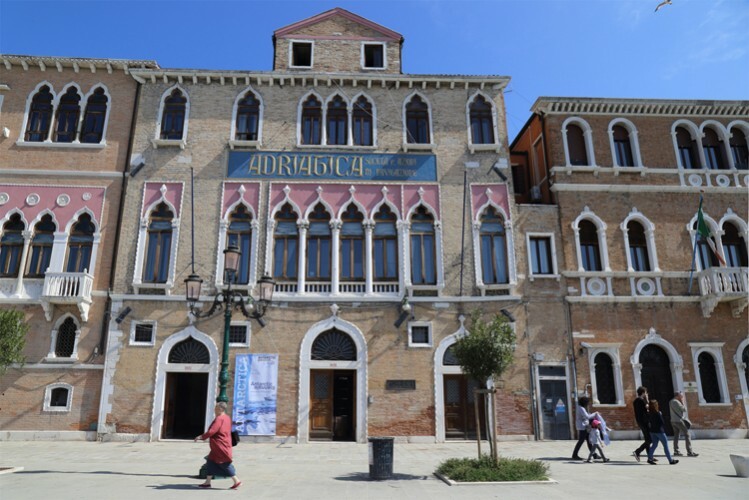 The Antarctic Pavilion at the Venice Biennale is an ongoing project initiated by the Russian artist, seaman and philosopher Alexander Ponomarev. Following an open call to young artists to participate in this unique and progressive supranational pavilion, Méadhbh was selected out of over 500 applicants from around the world to join fourteen other carefully selected international artists to present art projects at the Antarctic Pavilion at the 57th Venice Biennale of Art, the oldest and most prestigious art exhibition in the world. She was selected by a jury of distinguished and very influential international art world figures including Commissioner of the Antarctic Biennale, Alexander Ponomarev (Russia), and members of the Artistic Advisory Board: president and director of the Sharjah Art Foundation, Sheikha Hoor al-Qasimi (UAE); art critic, curator, author Hans-Ulrich Obrist (Switzerland); architect and artist Hani Rashid (Canada/USA); and Antarctic Biennale co-curator, Nadim Samman (Germany). The exhibition is composed of newly commissioned artworks by the fifteen international young artists. It also includes documentation of and selected artworks from the first ever Antarctic Biennale which took place in March earlier this year (2017) in which a hundred artists, scientists, philosophers and thinkers from around the world travelled to Antarctica to hold the first ever biennale on the white continent. Méadhbh is the only Irish artist to have been selected to participate in this international project. 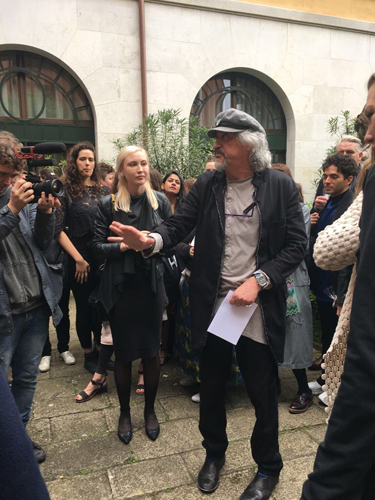 The open call to young artists was intended to extend the opportunity for emerging artists to join a project composed of experienced international artists and notably to acknowledge the generation who will be the next to face the world’s future environmental, social and political problems. Climate Simulator, Phase I. Méadhbh O’Connor from Méadhbh O’Connor on Vimeo. 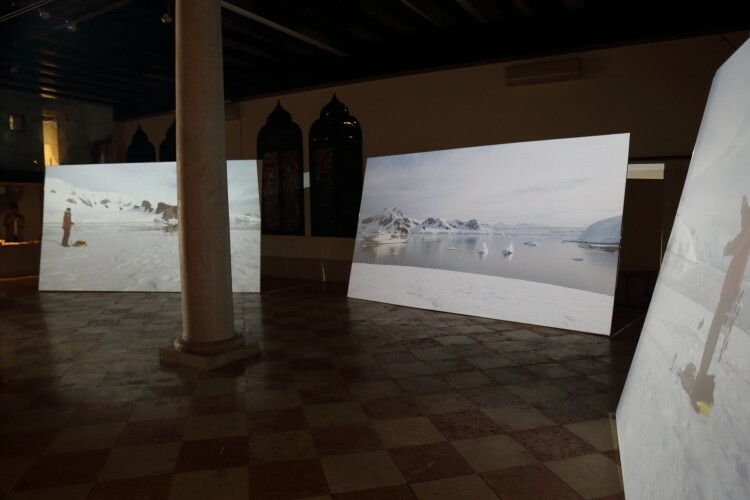 Currently on show at the Antarctic Pavilion, 57th Venice Biennale of Art. Duration: 7 min 48 sec single-channel video shared as an open source artwork (presented on a tablet and shared online). No sound. Description: A two-part project that includes a film and video documentation of a purpose-built scientific device. Filmed on location in the UCD College of Science. 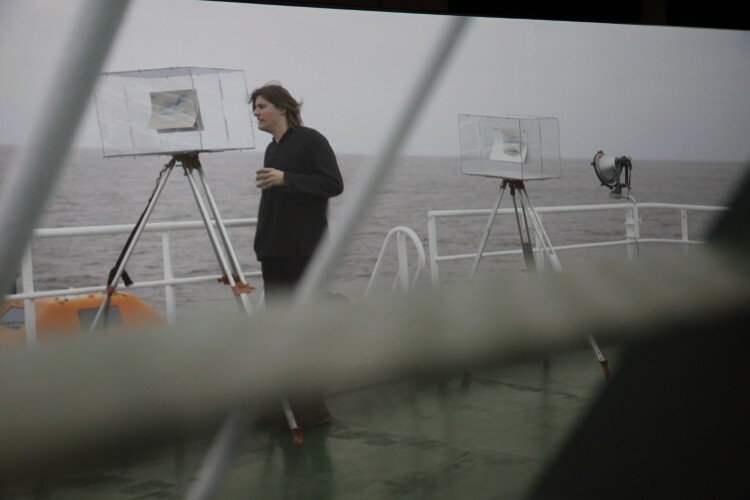 The first film ‘Climate Simulator’ is presented as a ‘YouTube’ instructional, or offered as an ‘open source artwork’, that shares with the audience the techniques used to create the imagery in the film. The films are presented on tablets to reinforce this idea of teaching and sharing knowledge. The film involves creating models of the Earth’s atmosphere in a small tank of water and photographing the results. The resulting images bear striking resemblances to the atmospheric phenomena seen at a macro scale on Earth, and are created with nothing more than water, salt, a colloid (milk), a plain white light and a camera. This film demonstrates how deviations in the balance of a few simple elements causes infinitely varied results, as seen in the chaotic nature of our climate system, a reminder of the dangers of interfering with the mechanisms of our atmosphere. Please feel free to copy the techniques used in the film to create your own images for educational and non-profit/non commercial purposes. 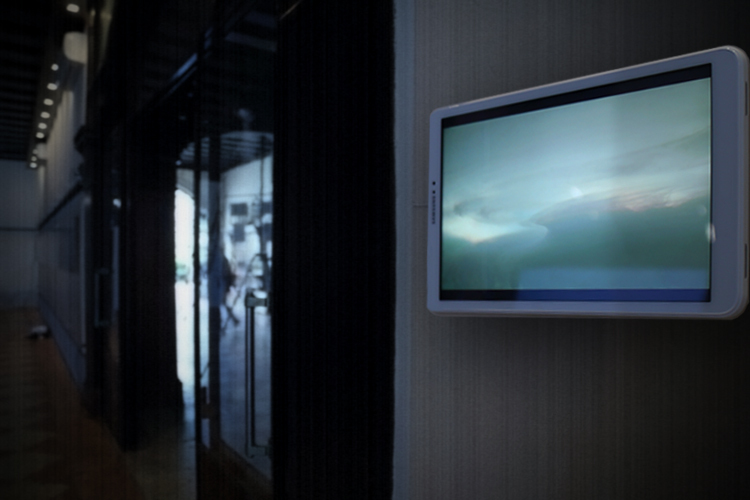 The videos are presented on two tablets mounted to the wall at the Antarctic Pavilion to adhere to the archival and documentary curatorial design of the overall show, and to reinforce the ideas behind the project of online sharing, open source knowledge, education and the relevance of climate-change to all people, hence the revoking of artistic ‘ownership’ over the project. ********************************************************************************************Climate Simulator, Phase II – Couette Device from Méadhbh O’Connor on Vimeo. Duration: 4 min 29 sec single-channel video presented on tablet and shared online. No sound. 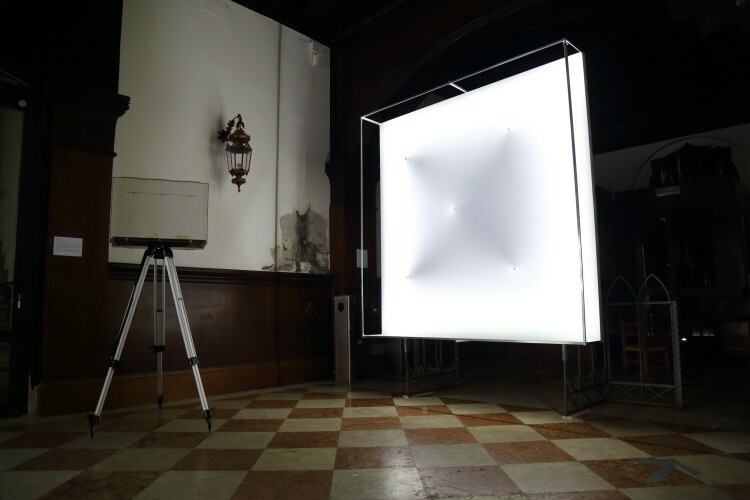 Description: The accompanying, second video (Climate Simulator Phase II) documents the artist’s purpose-built, recreation of a device used by mathematicians to examine flow patterns and turbulence. This is part of an ongoing project investigating planetary atmospheric circulation leading to Phase III of her project which will be to build the device in a sphere, which she is currently carrying out the University College Dublin (UCD) College of Science. Thanks to Mr Peter Kinsella of Modern Engineering and Dr Miguel Bustamante, UCD School of Mathematics and Statistics, for their kind assistance in building this device. 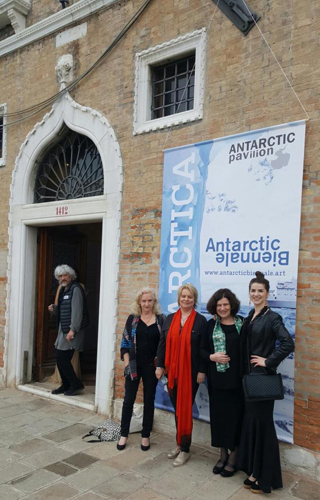 Antarctic Pavilion, 57th Venice Biennale of Art, 2017. 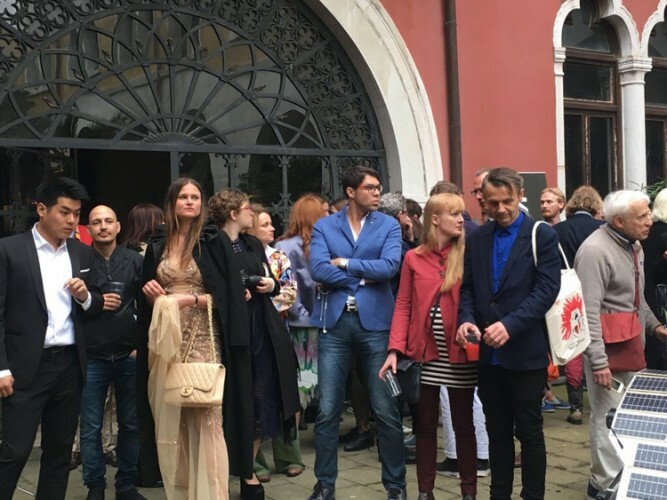 Vernissage at the Antarctic Pavilion, 57th Venice Biennale of Art, May 2017. Outside Antarctic Pavilion, opening night. 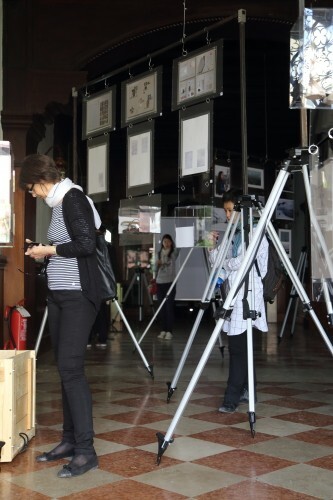 57th Venice Biennale of Art. Left to right: Alexander Ponomarev, Orla Davin-Carroll, Aoife O'Connor, Elizabeth O'Connor and Méadhbh O'Connor. 'Climate Simulator Phase I', by Méadhbh O'Connor. Presented on wall mounted tablets. 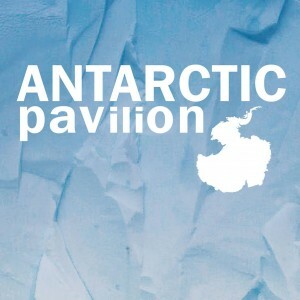 Antarctic Pavilion, 57th Venice Biennale of Art. General exhibition shot. Photo: Emer O Boyle. Antarctic Pavilion, 57th Venice Biennale of Art. General exhibition shot (detail). Photo: Emer O Boyle. Alexander Ponomarev, commissioner and founder of the Antarctic Biennale and Antarctic Pavilion, delivers a speech on the opening night. 57th Venice Biennale of Art, 2017. 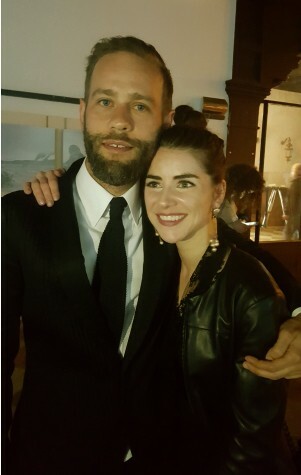 Curator Nadim Samman (selector and curator for the Antarctic Biennale) with artist Méadhbh O'Connor (Maeve O'Connor).